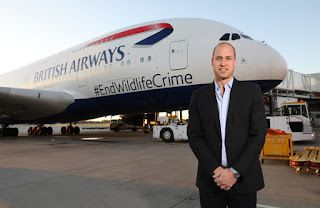 His Royal Highness The Duke of Cambridge departed from Heathrow this evening on a British Airways A380 aircraft displaying the message #EndWildlifeCrime, kicking off a mission to highlight the urgent global threat to wildlife and people from the illegal wildlife trade. Prince William will be undertaking a working trip to Namibia, Tanzania and Kenya. There he will be visiting a range of projects and meeting with conservationists, communities and law enforcement representatives working to halt poaching and illegal wildlife trade. The party is being flown by British Airways, a longstanding supporter of Tusk and a member of The Duke’s United for Wildlife Transport Taskforce. The Duke of Cambridge is being accompanied by Charlie Mayhew MBE, CEO of Tusk Trust - the conservation charity of which he has been Royal Patron since 2005 and Naomi Doak, the Head of Conservation Programmes at The Royal Foundation where The Duke’s United for Wildlife is based. Products from elephant, rhino, pangolin and tiger are amongst the most highly valued products traded and are often trafficked via established international transport networks. Criminals also use networks of corrupt officials and agencies to undermine sustainable development and the law, damaging the livelihoods and growth of local communities. Charlie Mayhew MBE, CEO Tusk said: "Tusk is proud to host Prince William on this important trip to underline the urgent threat to wildlife from the illegal wildlife trade. We look forward to showing our Royal Patron Tusk’s vital conservation programmes on the ground in Namibia and Tanzania as we work to secure a future for Africa’s wildlife. We are incredibly grateful to British Airways for their generous and continued support for Tusk - a relationship forged 25 years ago. We’re particularly pleased to see the #endwildlifecrime call to arms included on the aircraft’s livery – an evident commitment from British Airways to join in the fight to end international wildlife crime." Lord Hague, Chairman of the United for Wildlife Transport Taskforce, said: “As Chairman of the United for Wildlife Transport Taskforce I have witnessed how instrumental the air transport sector has been in tackling the illegal wildlife trade. Their efforts to raise awareness among both staff and passengers has played a vital role in disrupting illegal wildlife networks. As His Royal Highness the Duke of Cambridge departs for Africa I am pleased to see a key member of the Transport Taskforce, British Airways, add their powerful and influential voice to this important issue.”.